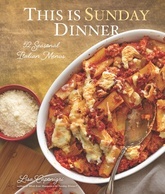 In Whatever Happened to Sunday Dinner?, Lisa Caponigri presented a year’s worth of delicious and authentic Italian menus for the entire family to enjoy. Now she’s back with another 52 dinners, but with a fresh new seasonal approach that reflects the cuisines of Piemonte (winter), Campania (spring), Sicily (summer), and Tuscany (fall). Throughout, Caponigri showcases Italy’s varied and abundant produce, from summery artichokes, apricots, figs, and the famous San Marzano tomato to hearty roasted meats and rich risottos to ward off the cold. The entire book brims with her energy, her reminiscences of living in Italy, anecdotes about her family, and all the advice needed to get a spectacular Sunday dinner on the table—every Sunday of the year.